If you haven't already seen, I decided to set my challenge in 2019 where I take a word and, based on that word, I focus my goals for the month around that. January's focus was "RENEW" and earlier this week I shared with you my "JANUARY IN REVIEW" where I looked back on the ups and downs of the month and updated you on how I found my first month of this little challenge. It's not the 1st of February at the time of posting so it's on to the next focus! I was struggling to pinpoint what word I should use to narrow my focus this month and so I actually asked over on my Twitter (@saraheliza_j) what people thought my focus should be and they chose "BALANCE". I completely agreed with the choice as, while usually I struggle to make time to balance personal life with university work, I've actually found this last month a slight neglect of my university work as the tables have completely flipped. 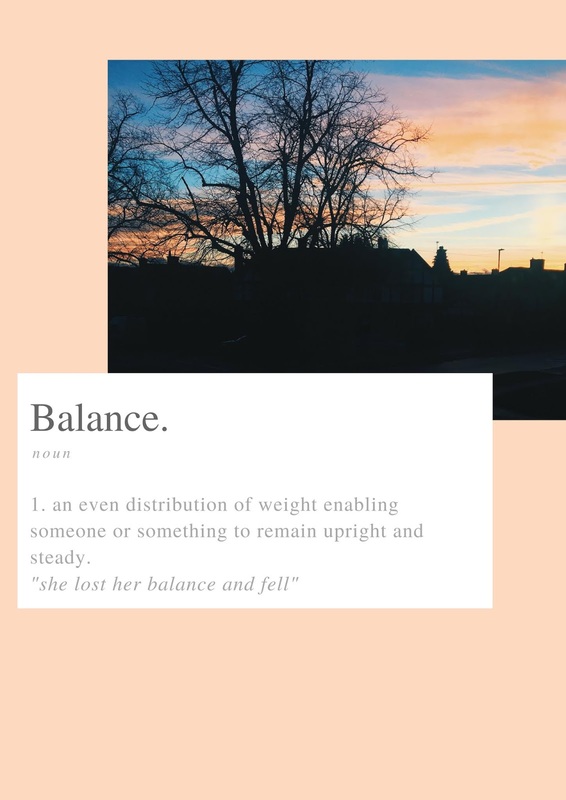 So, I think Balance was the perfect choice for February's focus as I try to find that common ground across different aspects of my life this month. Like I say, after being a workaholic last year, as I've re-discovered my interests outside of university, I've slightly neglected the work and it's started to pile up. Instead of just panicking and throwing myself back into work, I want to establish more of an equal balance between the two- making time for both things I need to get done and things I want to do. I'm already an avid planner but making sure I plan for both work and life equally will help me accomplish this in the next month. I've always struggled with diet and getting a good balance. However, more recently I've been having meals that are really satisfying and I'm craving a lot less the salty and sugary snacks I used to. Having said that, I do struggle to get the balance across all food groups; I try to eat mostly vegetarian meals during the weeks and, while I love the food I'm eating, I am wary I am not getting enough protein recently. So, I want to make more of an effort to have more balanced plates; portions of veg, carbs and protein. Also, I want to choose more healthier options for snacks but not feeling so guilty when I have a little chocolate or a packet of crisps. Creating a good diet for myself is an ongoing challenge for me but having it as focus this month will hopefully help me a little more. Since to IOS update and being able to see activity levels on Instagram, I think this is something a lot more people are becoming aware of in 2019. While, I think I use my phone a little less than the average during the day, I have the awful habit of checking my phone being both the first and last thing I do in a day. I want to try and reduce both the time and occurrences I look at my phone in February. My laptop is where I'm at most of the day; for both university and when relaxing. I'm thinking of trying to find a way that doesn't involve me looking at a screen for hours to enable me to do university work. In terms of relaxing, I'm going to make more of an effort to pick up a book instead of aimlessly searching YouTube this month. This is loosely tied around the theme of Balance but is something I want to give a go this next month. Everyone has down days and everyone has great days- there has to just be a balance between the two. I have been recently worrying that I'm having more downs than ups and so, I want to keep an eye on this over the next month to make sure I'm getting a good balance between the two and to also monitor if there's specific reasons why I have certain bad moods are bad days while also seeing what is it that makes me smile and happy and how I can implement those happy things into my life a little more often. Hopefully by tracking my mood I may find a better balance between the ups and downs over the next month. So there are four ways I want to tackle February's Focus of the month: Balance. I'd love to know your opinions on the focus I've chosen and if there's any other ways I can use the word Balance to make some healthy changes in February. What are some of your goals for February? What word do you think I should use to focus in March?